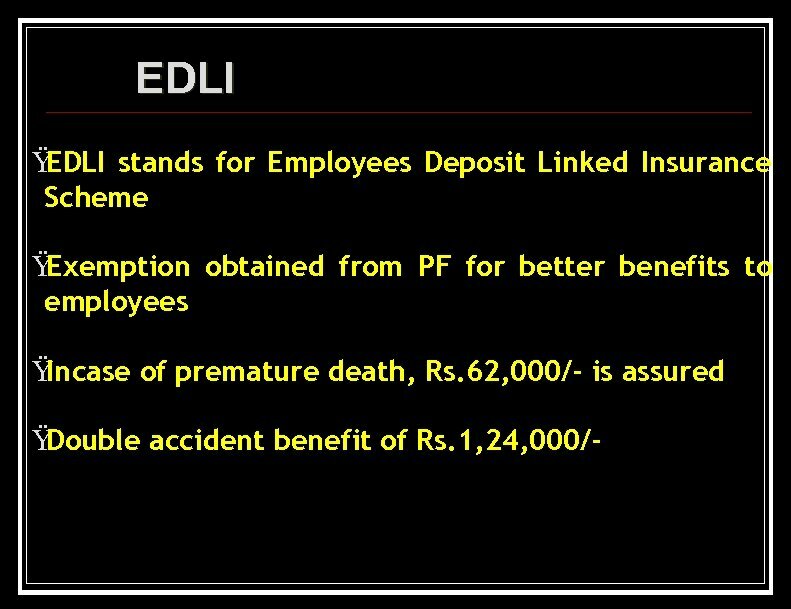 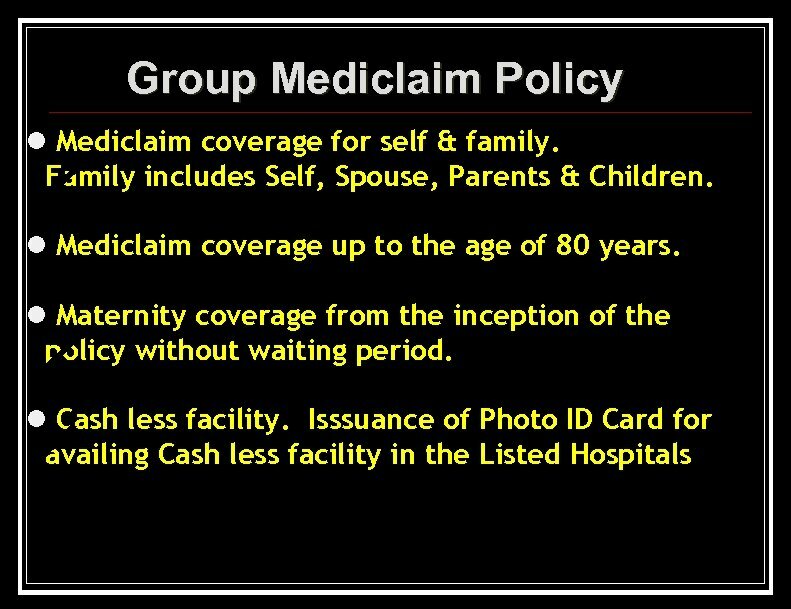 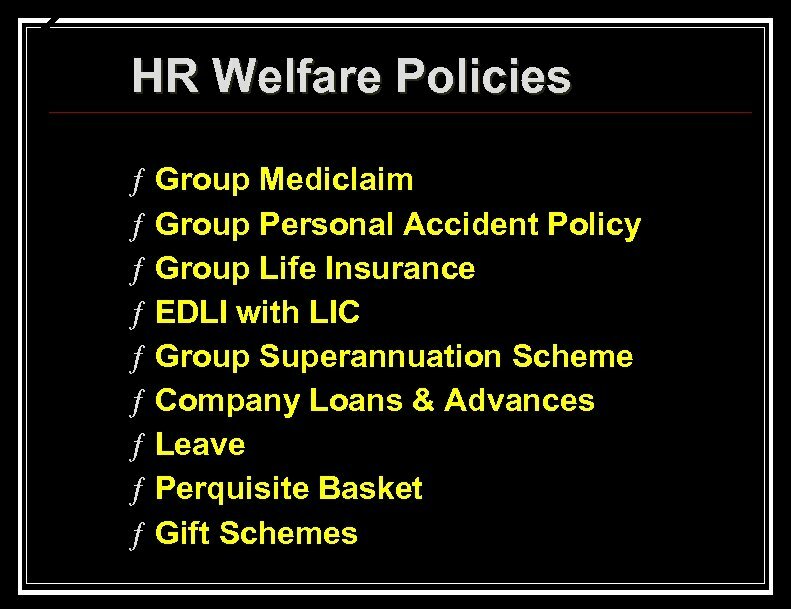 Group Mediclaim Policy l Mediclaim on floater basis. 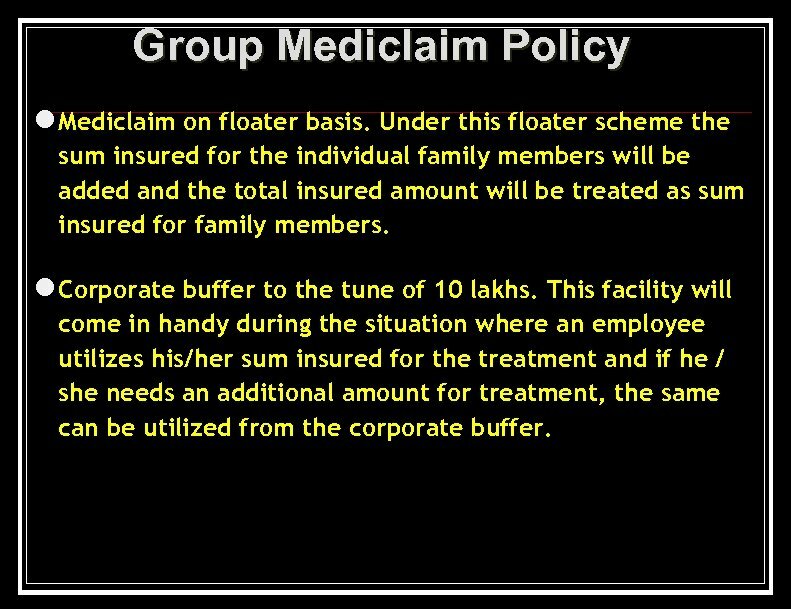 Under this floater scheme the sum insured for the individual family members will be added and the total insured amount will be treated as sum insured for family members. 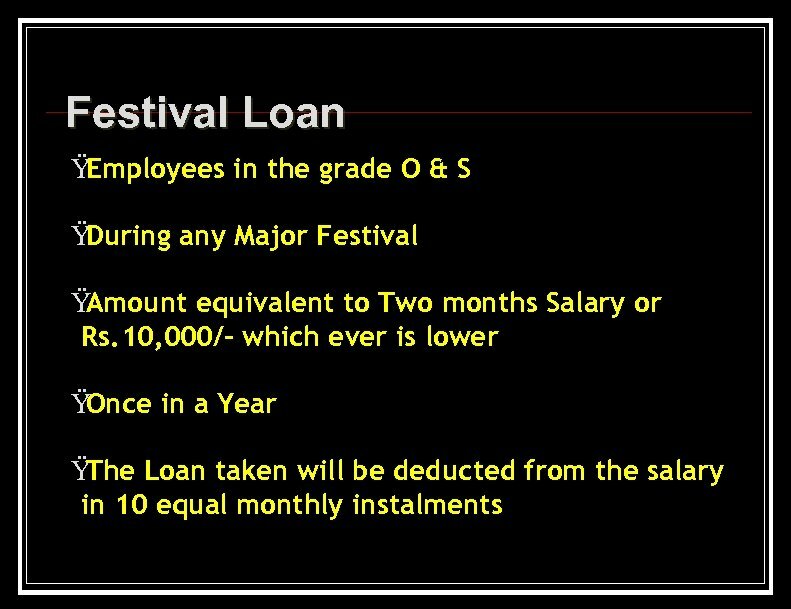 l Corporate buffer to the tune of 10 lakhs. 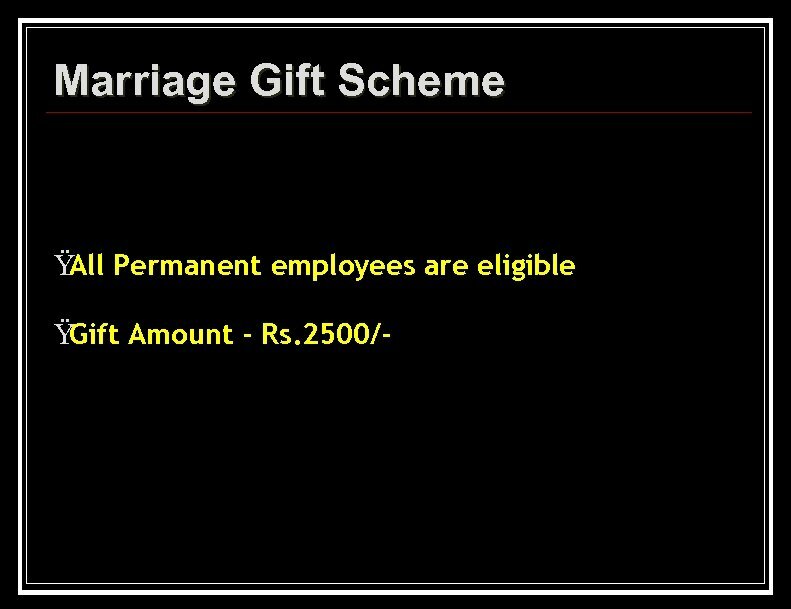 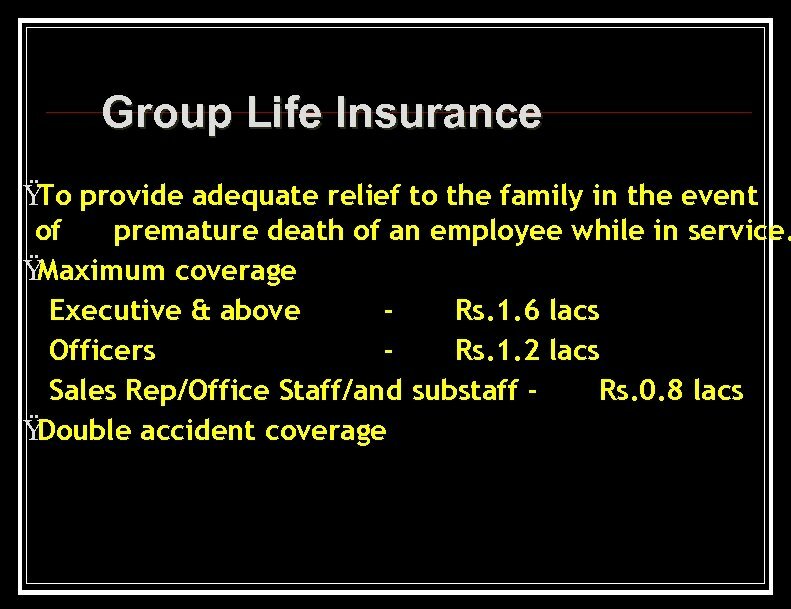 This facility will come in handy during the situation where an employee utilizes his/her sum insured for the treatment and if he / she needs an additional amount for treatment, the same can be utilized from the corporate buffer. 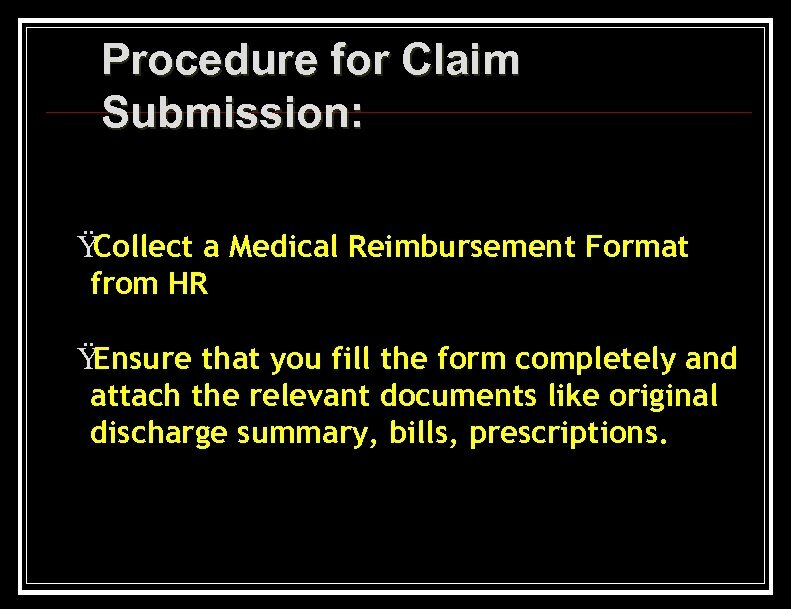 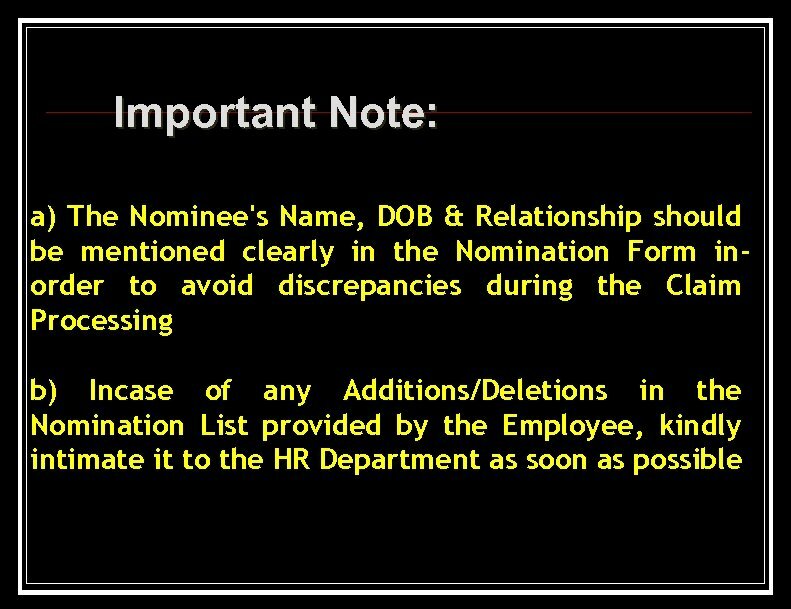 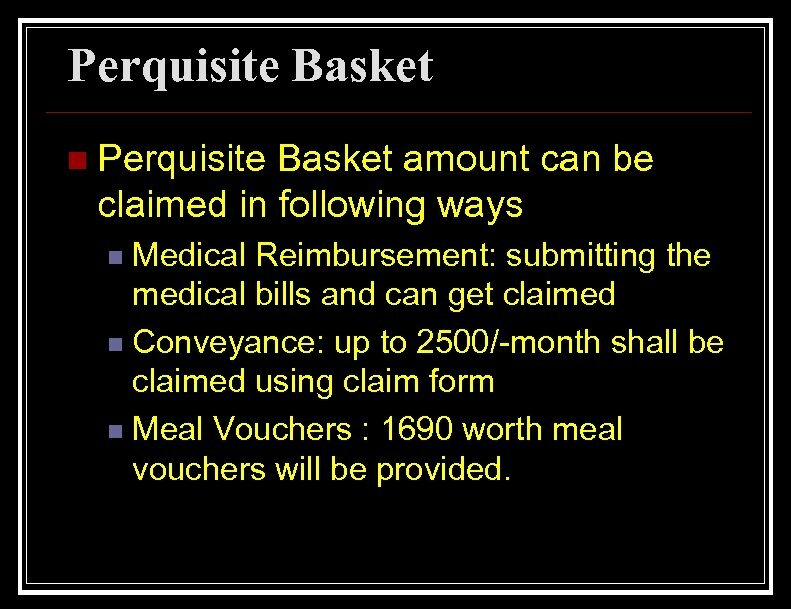 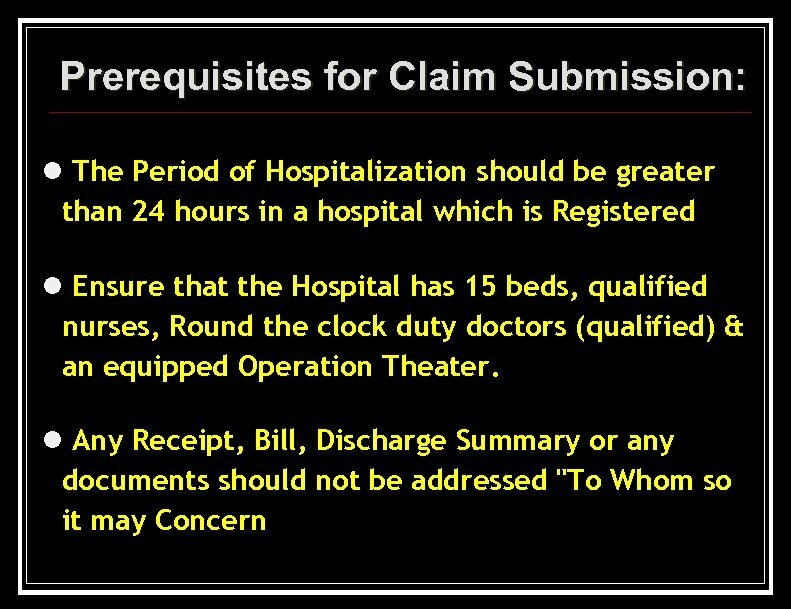 Procedure for Claim Submission: Ÿ Collect a Medical Reimbursement Format from HR Ÿ Ensure that you fill the form completely and attach the relevant documents like original discharge summary, bills, prescriptions. 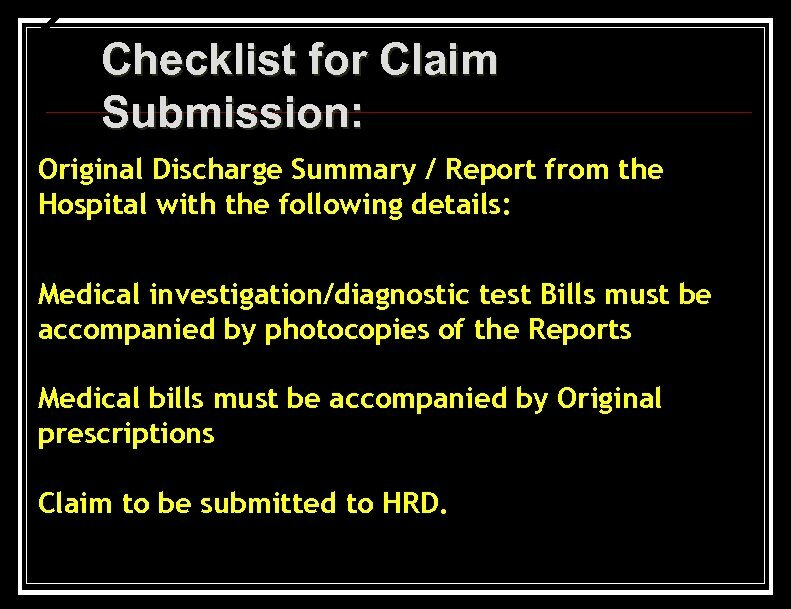 Checklist for Claim Submission: Original Discharge Summary / Report from the Hospital with the following details: Medical investigation/diagnostic test Bills must be accompanied by photocopies of the Reports Medical bills must be accompanied by Original prescriptions Claim to be submitted to HRD. 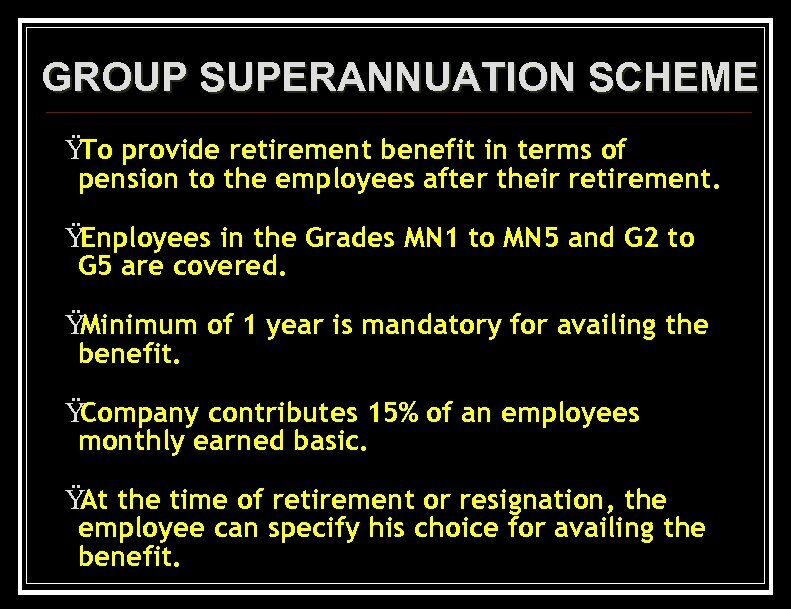 GROUP SUPERANNUATION SCHEME Ÿ provide retirement benefit in terms of To pension to the employees after their retirement. 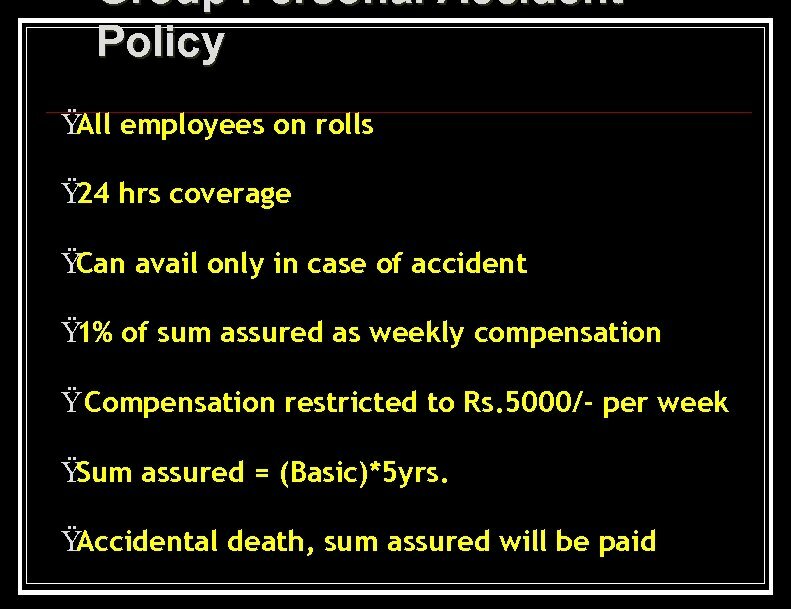 Ÿ Enployees in the Grades MN 1 to MN 5 and G 2 to G 5 are covered. 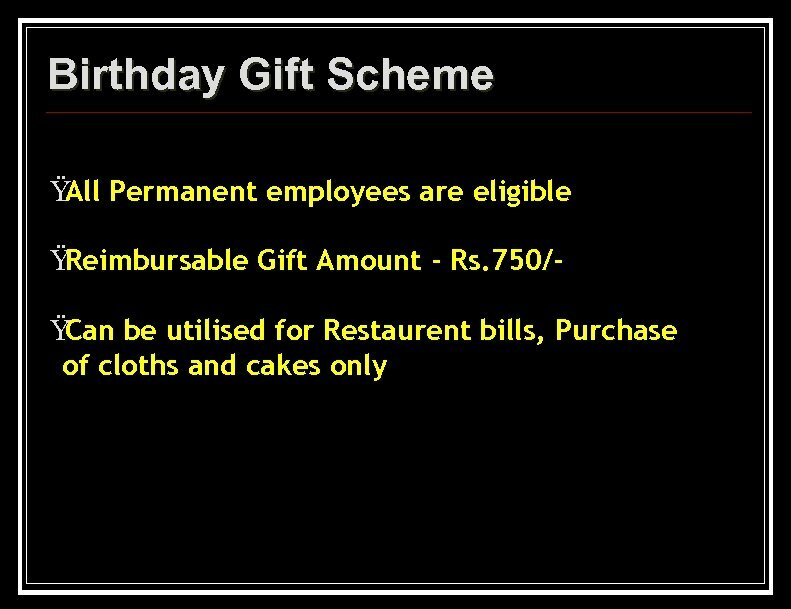 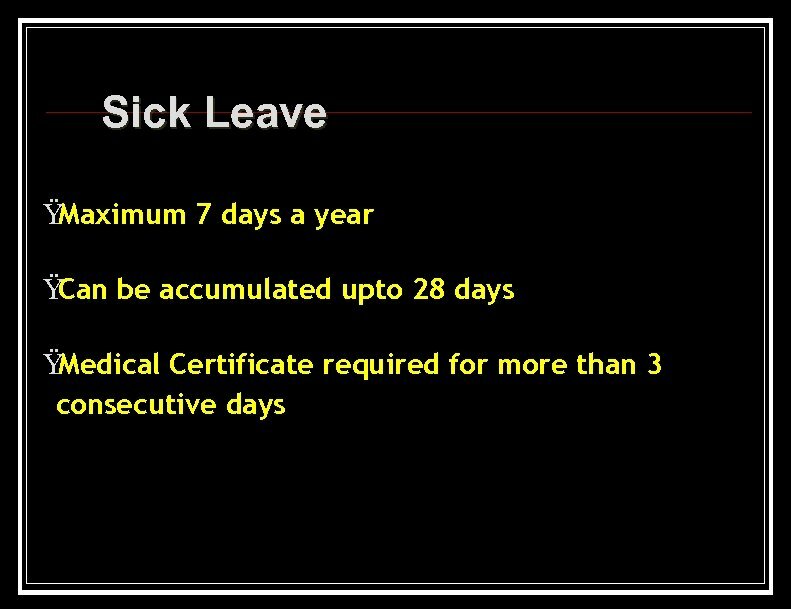 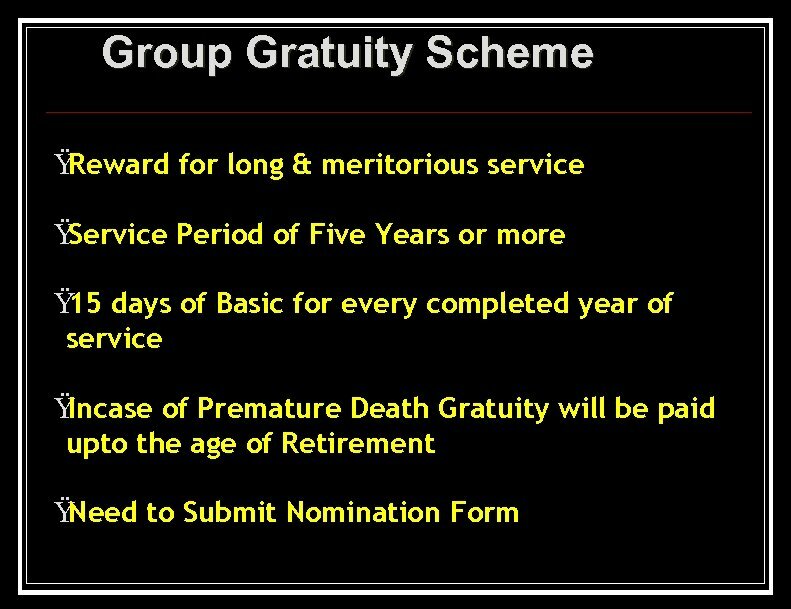 Ÿ Minimum of 1 year is mandatory for availing the benefit. 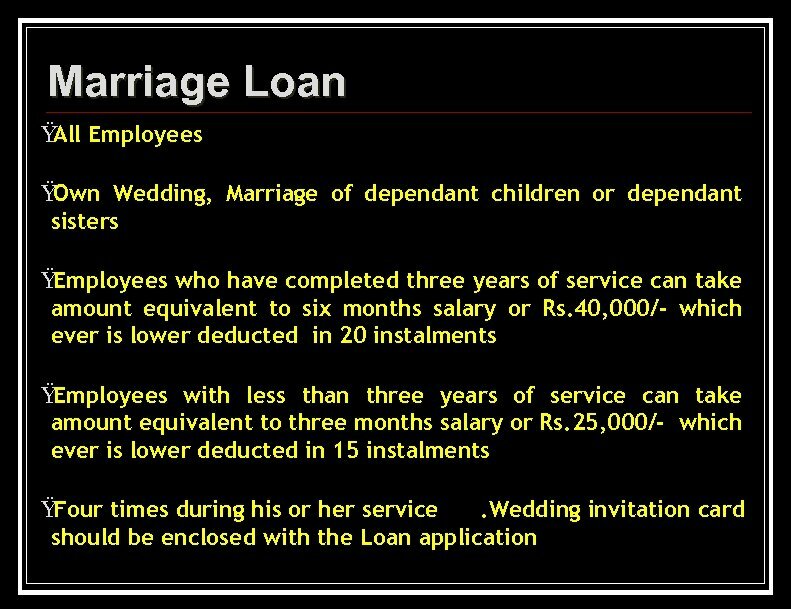 Ÿ Company contributes 15% of an employees monthly earned basic. 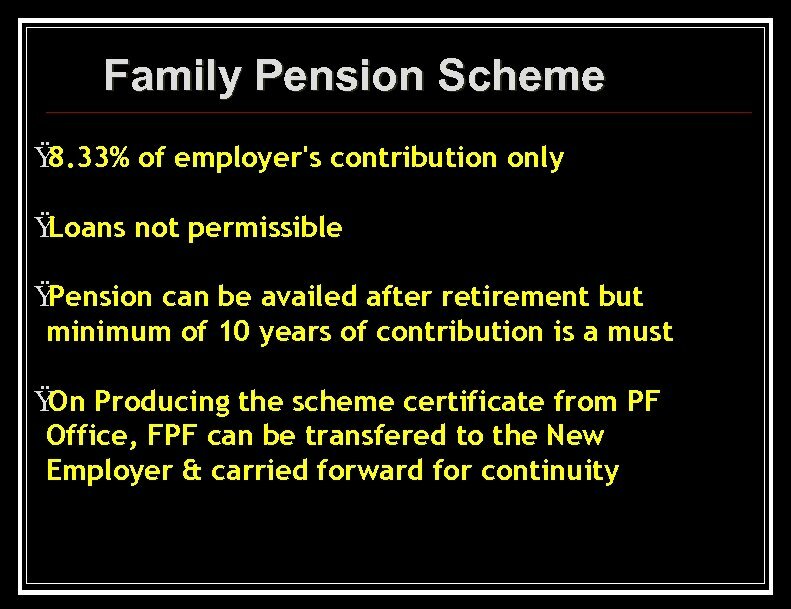 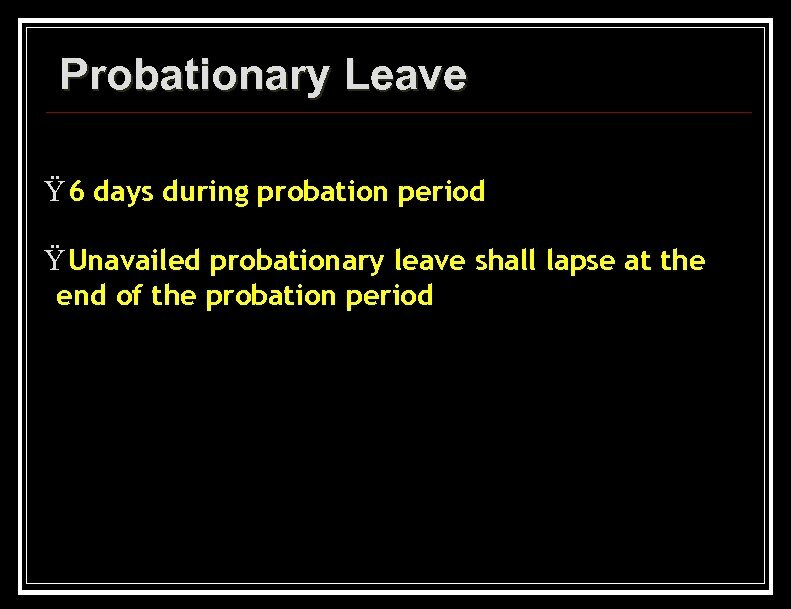 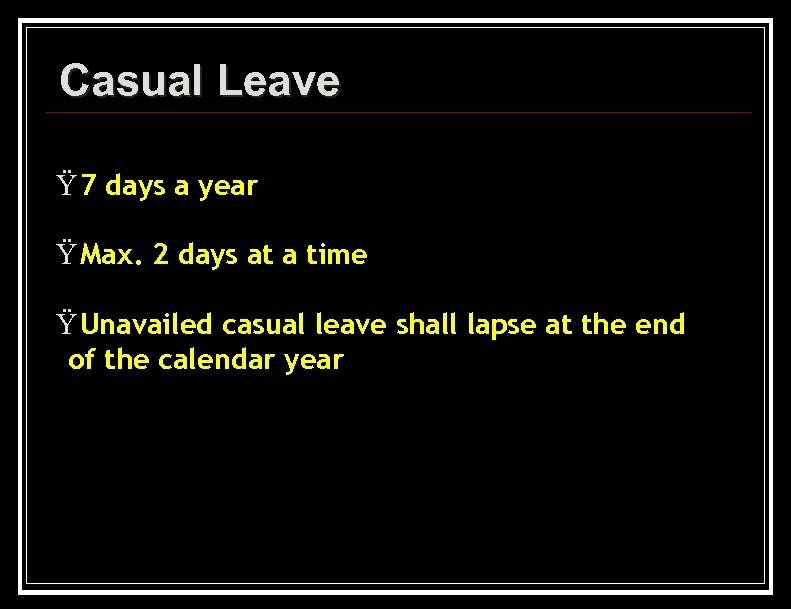 Ÿ the time of retirement or resignation, the At employee can specify his choice for availing the benefit. 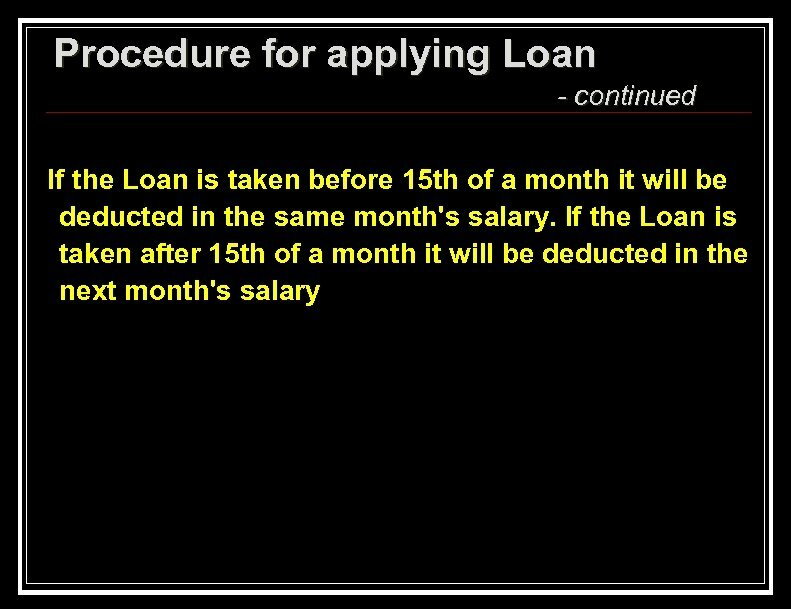 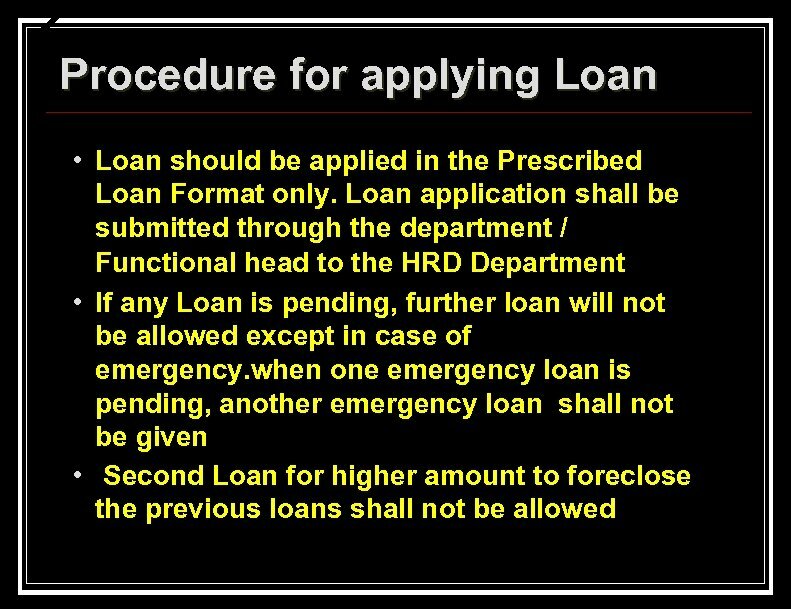 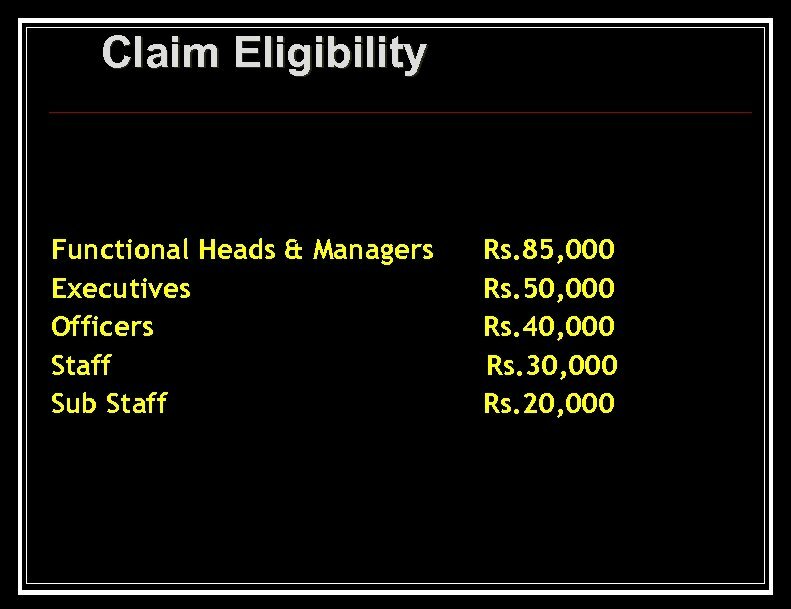 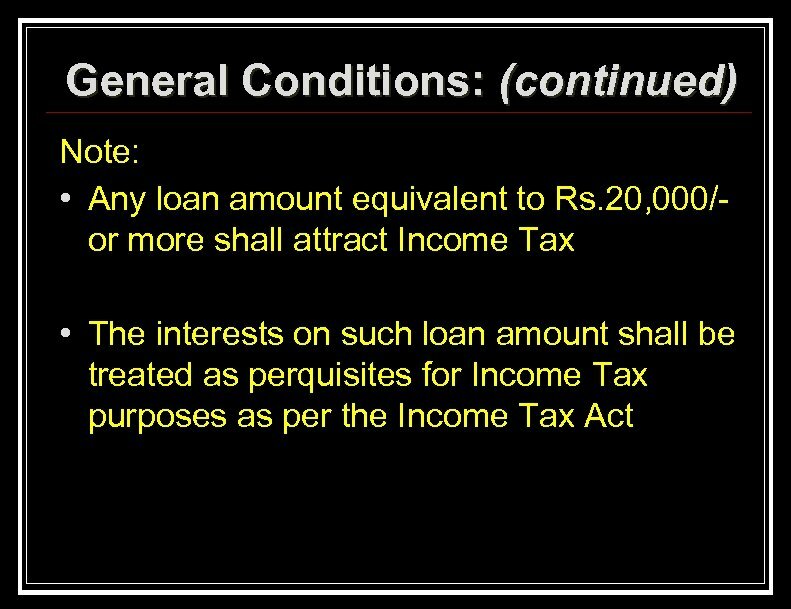 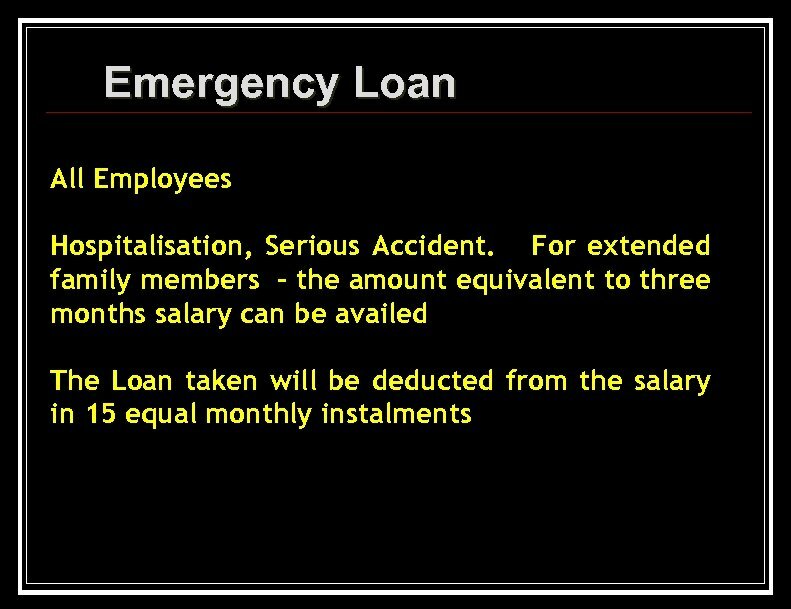 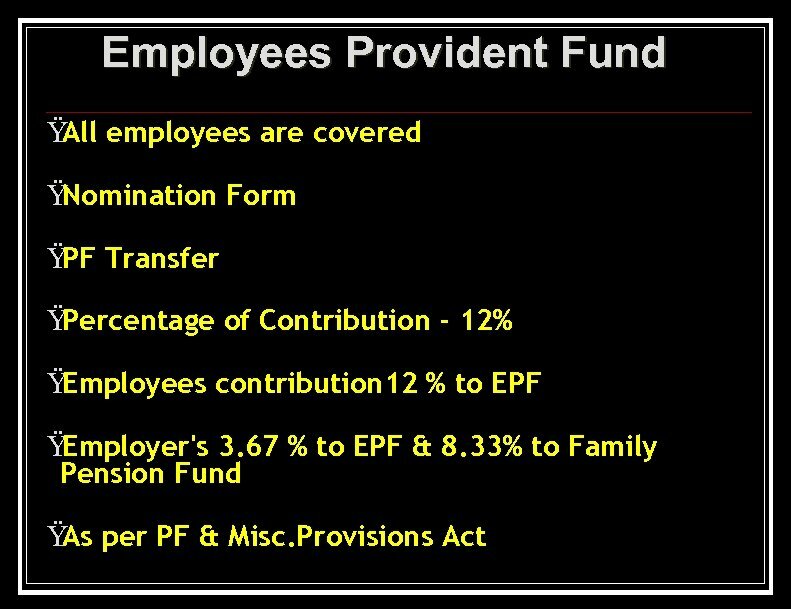 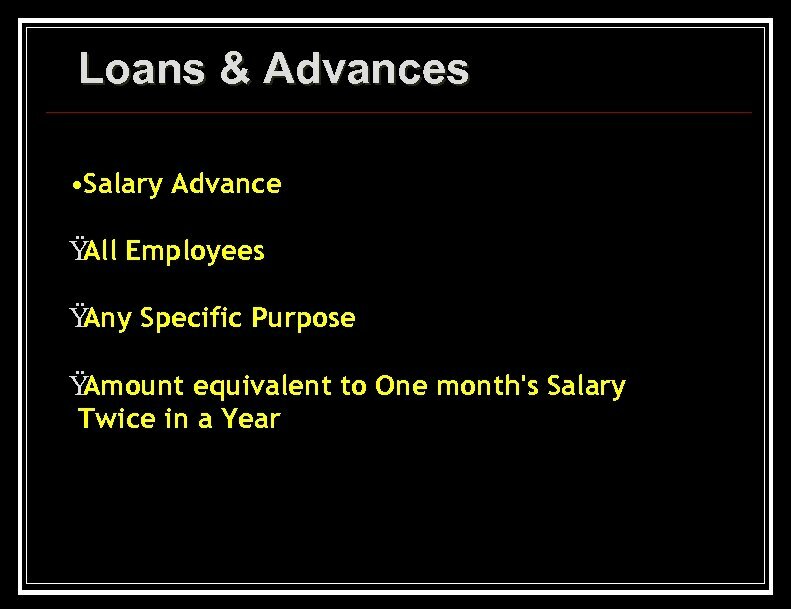 Privilege Loan Ÿ Eligibility for all Employees Ÿ House Rent Advance, Children School Admission Amount equivalent to Five months Salary once in a Year Ÿ The Loan taken will be deducted from the salary in 12 equal monthly instalments Ÿ Bills/ receipts paid or prospectus / fee structure of the school or college towards admission need to be produced along with loan application. 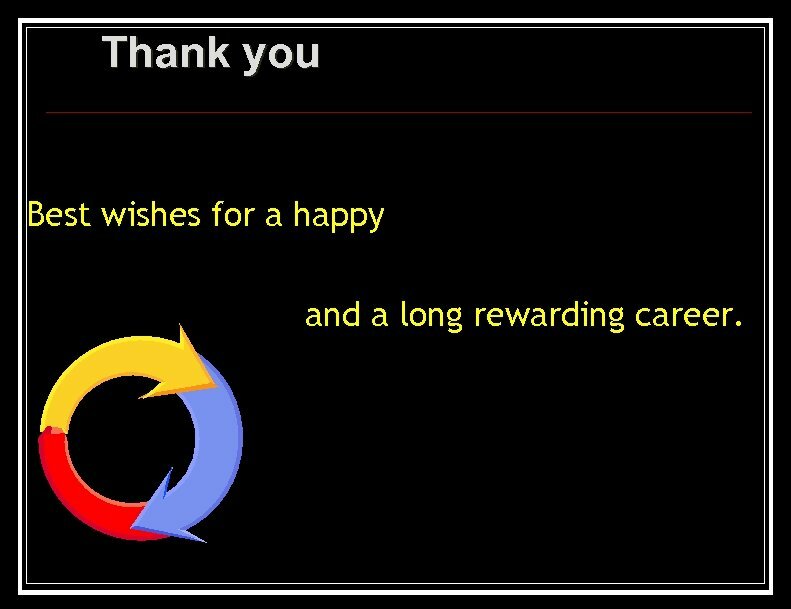 Thank you Best wishes for a happy and a long rewarding career.